Social Baby | Why Black And White? In simple terms, because babies love it - and if you have any reason to doubt this, try showing a baby something black and white. Look at their response, they find most things black and white very interesting. Even newborns like Emily, below, who is just one week old. At birth, babies' vision is limited and not as well developed as ours. There is a debate as to whether or not babies can see in colour, but there is agreement that high contrast images and patterns will be of most interest. BabyShapes is high contrast visual material which has been specially created to be suitable for the visual capabilities of your baby. Alertness - Is your baby fully awake and looking around? If you are changing after a nap, your baby may be in a sleepy state, and prefer to lie quietly, enjoying the sound of your voice. If your baby turns away from the image, he or she is letting you know the image is not of interest at this moment. Don't be concerned, your baby has just communicated with you! Try again when your baby appears more interested in the surroundings. Age and Maturity - Newborn babies can be very alert, but they can also tire quickly. Your baby may seem interested at first but then quickly lose interest. This is completely normal. At a few days old, all activities require a great effort by baby. Older babies may look intently for quite long periods. 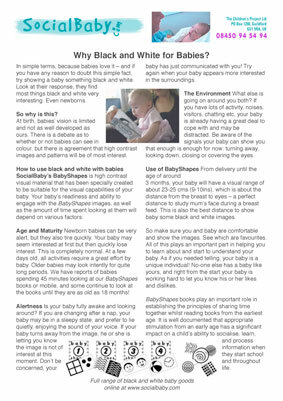 We have reports of babies spending 45 minutes looking at our 'BabyShapes' books or mobile, and some continue to look at the books until they are as old as 18 months! The Environment - What else is going on around you both? If you have lots of activity, noises, visitors, chatting etc., your baby is already having a great deal to cope with at the same time, and may be distracted. Be aware of the signals your baby can show you that enough is enough for now: turning away, looking down, closing or covering the eyes. Use of BabyShapes - When your baby is delivered and until the age of around 3 months, he or she will have a visual range of about 23-25 cms (9-10ins) which is about the distance from the breast to eyes - a perfect distance to study mum's face during a breast feed. All of this plays an important part in helping you to learn about and start to understand your baby. As if you needed telling, your baby is a unique individual! No-one else has a baby like yours, and right from the start your baby is working hard to let you know his or her likes and dislikes. BabyShapes books play an important role in establishing the principles of sharing time together whilst reading books from the earliest age. It is well documented that appropriate stimulation from an early age has a significant impact on a child's ability to socialise, learn, and process information when they begin school. 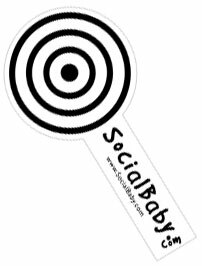 If you want to try something black and white with your baby, you can download this pdf of a lollipop as used in The Social Baby book. To make a realistic lollipop, print the pdf onto heavy A4 paper or cut it out and stick it onto card. You can of course just use the printed paper. See how your baby reacts to the shape. See how your baby follows the lollipop as you move it slowly from side to side. Download our Why Black and White for Babies? pdf leaflet based on this page. It is FREE to download, copy and distribute provided you make no changes.